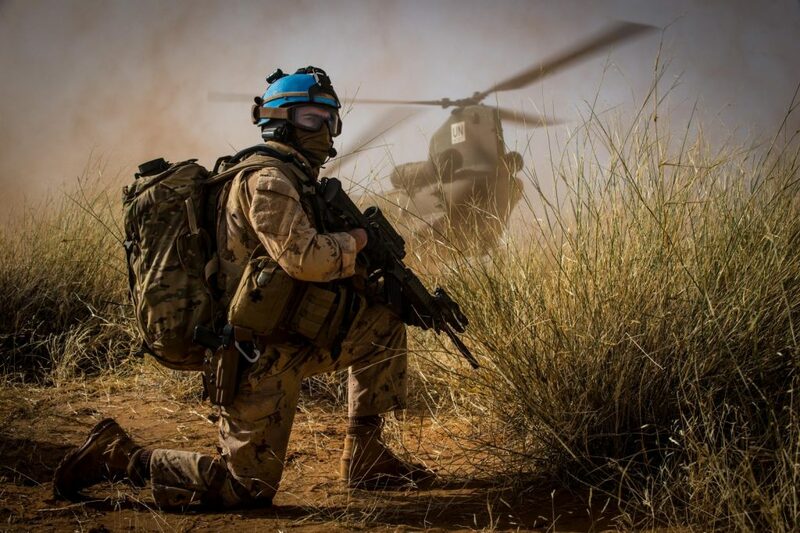 On November 1, a CH-147F Chinook and two CH-146 Griffon escorts responded to an IED strike about 100 kilometres northeast of Gao in central Mali that critically injured two civilian contractors working for the United Nations. As the helicopters made their way to a Role 2 Chinese-run hospital in the region, the medical team in the back of the Chinook worked feverishly, performing multiple interventions to save the lives of both patients. 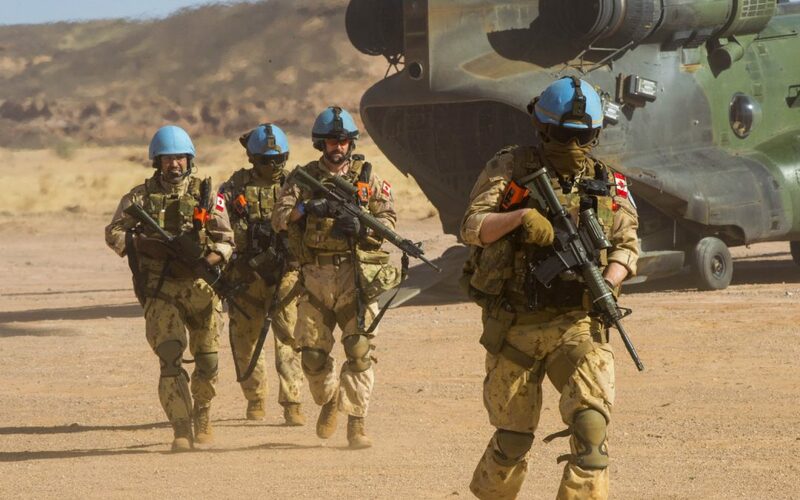 Forward aeromedical evacuation is a relatively new capability for the Canadian Armed Forces (CAF), created at the direction of the Chief of the Defence Staff, Gen. Jonathan Vance, in July 2017 specifically for the deployment of Task Force Mali a year later. On standby 24/7, the aircrew and medical team, many with experience in Afghanistan and Iraq, are critical to the movement of troops in one of the UN’s most dangerous peacekeeping missions. While much of the initial focus has been on the role of the four-person unit of critical care doctors, nurses and medical technicians, equally important has been the force protection team, a dozen soldiers handpicked from the 3rd Battalion of the Royal 22ᵉ Régiment to secure the area and interact with locals when the helicopter lands and to assist the doctors once casualties have been loaded and the team is back in the air. The Van Doos, grouped into three teams of four soldiers, were central to six medevac flights during the first rotation and more than 25 transport operations, moving troops and cargo to distant UN bases and Malian villages. “All four of those infantry folks are very well armed and well trained, but they are also well trained in the medical side of things. You’ll almost see an eight-person med team back there,” said McKenna, a helicopter pilot. An Operation Presence-Mali member of the force protection team participates in a combat casualty exercise in Mali on December 17, 2018. Historically, the Air Force has often drawn its door gunners from the Army, so integration with an aircrew is certainly not new. Neither is integration with airborne medical teams. A basic forward aeromedical evacuation program was developed in 2007 for the Griffon helicopters when an air task force was deployed to Afghanistan to support Canadian and coalition operations, though allies often had helicopters better-suited for the role. But the 2017 directive created a scalable capability that can be ramped up from a single medical technician to a larger critical care team, depending on the need. “All those people are aircrew,” explained Lieutenant-Colonel Richard Hannah, 1st Canadian Division Flight Surgeon. “They are all air medical evacuation specialists that fall under all the same rules as the pilots, loadmasters and flight engineers. The directive also brought together the Air Force, Health Services and Army in a way that had never been attempted before, said Colonel Travis Morehen, the commanding officer of 1 Wing and the commander of the second rotation of Task Force Mali. “It’s incredible to see those young master corporals, corporals, even privates, seamlessly integrate with lieutenant-colonel trauma surgeons in the back of that Chinook,” he said of the force protection team that has received extensive medical cross training while in theatre. For the soldiers themselves, the Mali mission has been a unique opportunity to help build something from the ground up, said Master Corporal Jean-Francois Lavergne. Through trial and error, the force protection team, medical team and aircrews have developed the standard operating procedures (SOP) and refined the tactics, techniques and procedures for forward aeromedical evacuation, often while literally on the fly. Prior to deployment, the fully bilingual force protection team underwent extensive and specific medical training, first confirming their basic medical skills and then completing a second level medical course before doing tactical combat casualty care (TCCC). “It’s the most advanced level of medicine we can learn without being an actual medic,” explained Lavergne, who was on a NATO exercise in Norway when he was asked to join the mission. After courses in Edmonton “to understand how the air force operates,” the aeromedical evacuation capability was certified during training in Wainwright, Alta., prior to Exercise Maple Resolve 2018. The final assessment included not only the trauma skills of the soldiers, but also their ability to interact with the local other UN forces and the local population in villages at incident sites. Every medical response was different, but “regardless of the degree of the injuries, the guys were able to do everything they needed to do” to provide medical assistance, a validation of the SOPs, said Lavergne. While he expected the next rotation to “pick up directly where we left it and find ways on their own to improve” those standards, one of the lessons from the first rotation was the need for an additional four-person force protection team to better meet the high operational tempo.